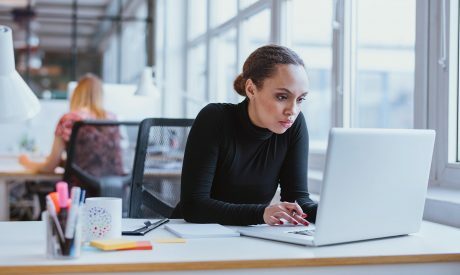 In office spaces, the background noise level is generally low. Hence, people unintentionally overhear conversations – a difficult situation for all concerned. To address this problem, sound masking systems emit a soft, inconspicuous background sound with the use of a loudspeaker system. The ambient sound level becomes more uniform and otherwise noisy distractions are muffled by the sound masking. 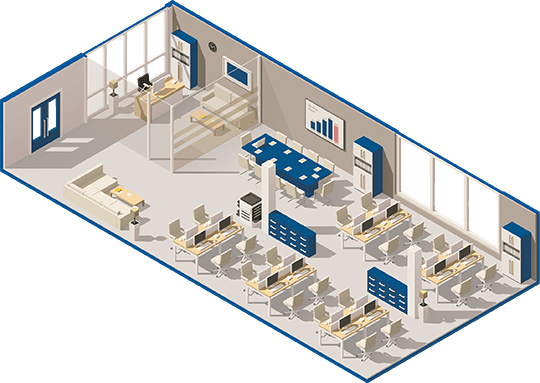 An office space is a dynamic environment in which ambient noise and the volume of sound distractions vary a great deal depending on the schedule and activities underway. 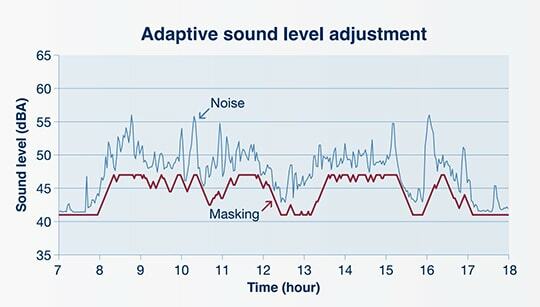 To be optimal, sound masking must adapt to changes: It must increase during very active periods, and become more discreet when the area is quieter. Only SmartSMS makes this possible ! 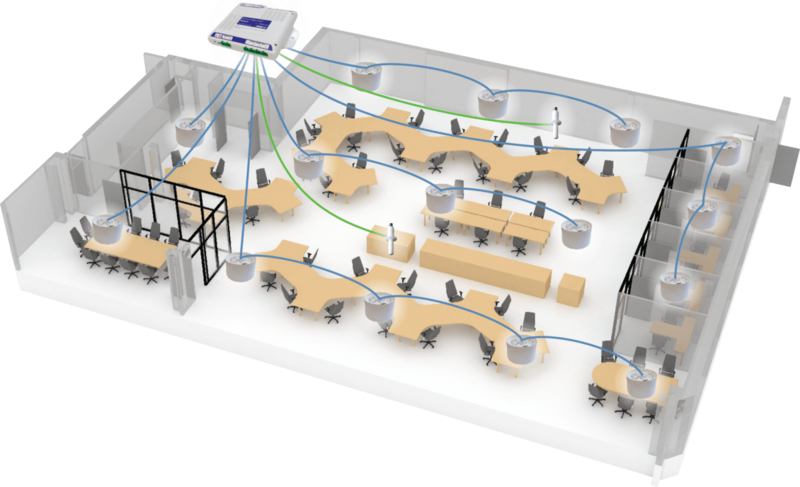 Our adaptive adjustment system (US 8116461 B2) identifies variations in ambient noise in real time, from signals supplied by sound level sensors installed in the ceiling of the work space. And, thanks to an advanced signal-processing technology, it automatically adjusts the masking volume depending on the intensity of conversational noise and other noise distractions. The adaptive volume control system provides an unparalleled optimization of both acoustic comfort and effective sound masking. 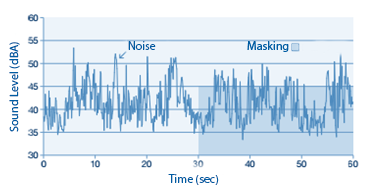 Control of masking volume based on the level of disturbing noise in a room. Disturbing noise is measured using sound level sensors installed in the ceiling. Masking sound level is adjusted automatically in real-time. Adjustment rate, high limit and low limit are programmable separately, for each zone. An input mixer allows for the combination of any active input with any output channel. 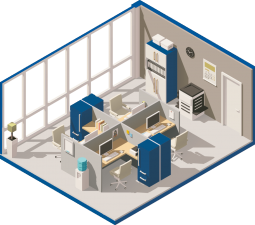 The challenge: to produce optimum masking sound for all work space characteristics. 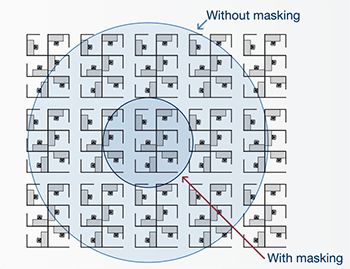 Parameters such as size, type of ceiling, wall coverings, and furnishings have a direct influence on the propagation of sound masking. If the masking system is not properly calibrated to the specific conditions of the room, it becomes ineffective and/or irritating. The advantage of SmartSMS-NET is that it adapts to characteristics that are specific to each work environment. Its unique calibration system (patent no. : US 7460675 B2) uses a sensor to measure the acoustic response and the background noise in the space. Based on this data, it automatically calculates the noise spectrum that must be used to emit a soft, uniform, and non-disruptive masking noise. 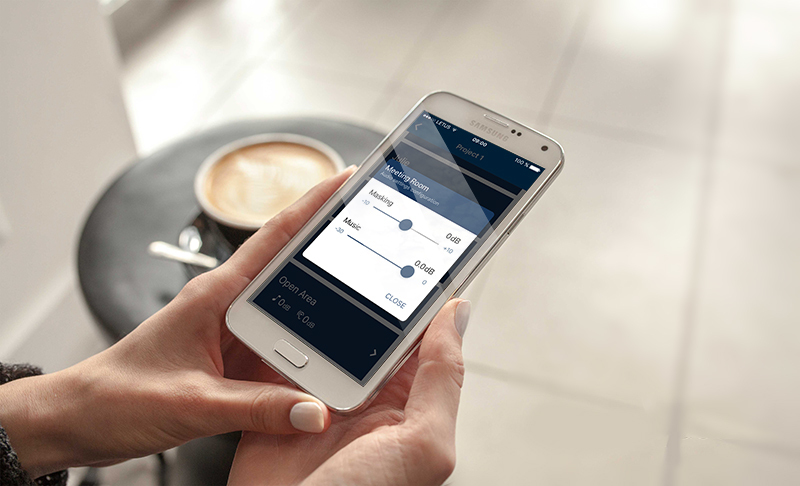 With SmartSMS-NET, a masking zone can be completely calibrated in less than one minute, thanks to Soft dB automatic calibration process (pat. US 7460675 B2). This automatic adjustment is done not only on 1 /3 octave bands, but on 340 narrow band spectrum. It is quick, precise and provides an unparalleled regular smooth and comfortable sound masking spectrum. The calibration quality is measured by the system’s integrated frequency analyzer. At a glance, it provides indications as to whether the masking generated is in complete conformity with the desired sound spectrum. 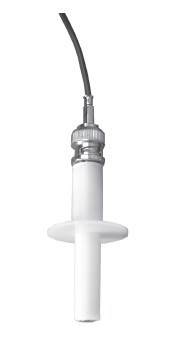 The SmartSMS-NET is very flexible, it can cover small or large masking zones. 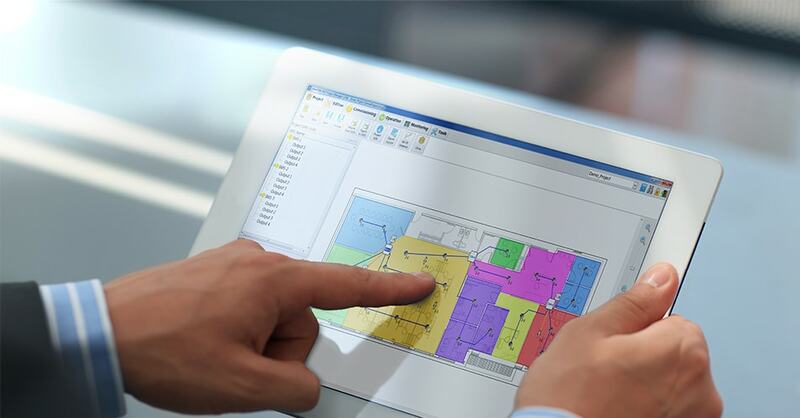 It combines the flexibility of networked system and the cost efficiency of centralized systems. Changes can be made very easily, the layout is integrated into the software. 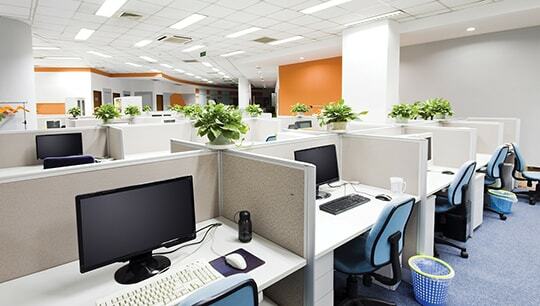 It is easier and more economical to use sound masking than conventional soundproofing methods to obtain greater speech privacy in office spaces. 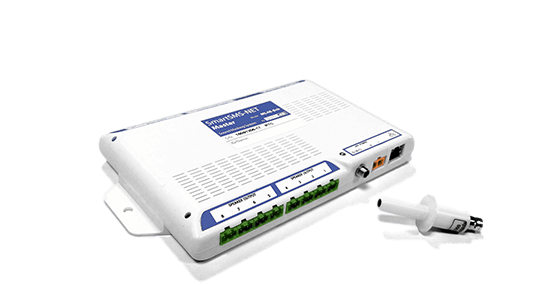 The SmartSMS-NET has proven to be an effective, uncomplicated solution for increasing confidentiality in all types of work environments. As mentioned earlier in the Adaptive Volume Control section, the Soft dB patented adaptive volume control feature provides an unparalleled optimization of both acoustic comfort and effective sound masking. That unique feature allow the sound masking system to adapt to the sound levels of the room; It must increase during very active periods, and become more discreet when the area is quieter.